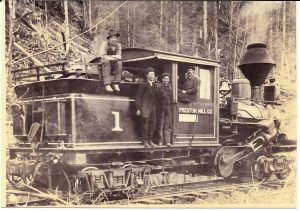 This Kinsey photo of the High Point Mill Co. logging crew on the north face of Tiger Mountain shows several interesting features. On the left is a donkey with a boomerang spark arrestor (the curved pipe extending from the top of the smoke stack to the ground). Also, the locomotive in the middle of the photograph has not been identified as belonging to High Point. Records showed they only owned the Climax shown in last week’s “Looking Back.” Perhaps the High Point company borrowed this one from the Preston Mill Co. about 1924, when Preston’s inventory of engines showed two instead of the three that it owned.